You may turn 90 today, but you are the eternal child who brings out the inner child in all of us. I know it’s Minnie’s birthday, too, and I also wish her a Happy Birthday! Walt Disney said to remember that it all started with a mouse, and what a special mouse you are! I miss my mom and Ben today. They would surely have joined in the festivities. I must admit that I feel pretty lonely. But, I’m celebrating the long history that we have and remembering wonderful, whimsical times with and about you. Though you’re a few years older than my mom would have been, she loved you from the time she was a child and she passed that love on to me. 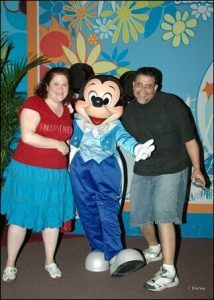 She was in her 50s when she and my dad went to Walt Disney World for the first and only time, and without me! 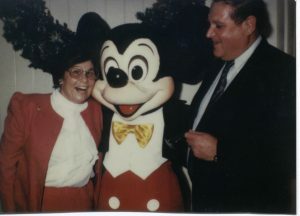 I will never forget her phone call, giggling as she exclaimed, “Abby, I met Mickey!” This picture was taken on that day, and it is my favorite picture of my parents because, for me, it captures my mom at such a happy moment with her inner child aglow, and my dad was so amused. 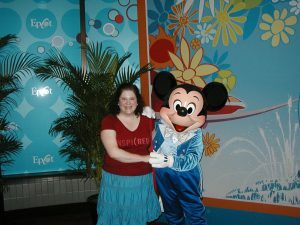 When I picked them up at the airport, my mom deplaned like the other children, unabashedly carrying a big Mickey Mouse and Epcot Figment in her arms. My mom was the consummate child at heart, and I get that from her! When I first started dating Ben, he was not as obsessed with Disney as I was. That changed quickly, and our first dates often began with a stroll through the Disney Store that was near the office where we worked and met. We went to every new Disney film on opening day and we practically studied the Disney Catalogs, which, sadly, are no longer published. I found several copies that he kept because he loved the covers and I’ve kept those. 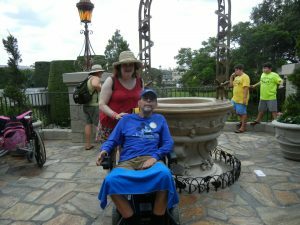 We always treasured our visits to Walt Disney World, but after Ben’s ALS diagnosis, we immediately booked a trip to Walt Disney World, and we were so fortunate to be able to go four more times. We didn’t know what we were dealing with, or how much time we had, and we wanted to go to the place that made all our worries disappear, at least temporarily. I admit that I was the one who had to greet all of my Disney friends. But, with you it was different. Ben always wanted to see you (and Minnie). And, after his ALS diagnosis, it was emotional and tear-filled. 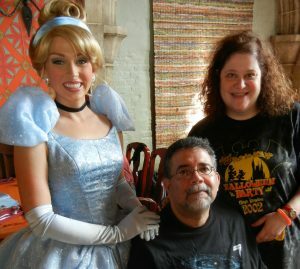 With an ALS diagnosis, we wanted and needed to feel the pixie dust, and more than once I asked you for some magic. I do remember that a sensitive cast member saw that Ben’s meeting with you was deeper than just seeing a favorite Disney friend. As we left, he quietly handed me a “ruby” that he told us was found by one of Snow White’s dwarfs in the mines, and he said he hoped it made our wishes come true. I still have it. It may not have fulfilled the wish that ALS would be cured, but I still believe that it helped us to create many wonderful memories. I thank you for that. Mickey was always there to help Ben. For as long as he could, Ben would insist on walking to stand in his pictures with you. It was truly touching when you spotted Ben in the electric wheelchair, helped him up and escorted him to the area where photos would be taken. He rode up to you when he lost the strength in his legs. It was then that I was hit with the reality of his situation. It might seem strange that this moment was a revelation, when I was living with his ALS. But, living with something didn’t mean I really reflected on the entire situation. We adapted to the issues as they arose without really looking at them as milestones in the progression of the disease. Deciding that he could no longer walk up to you was a sign that ALS was winning the battle. But, Ben also had an incredible attitude, never lost his smile and laughter, and he remained determined to engage in life, especially with you at Walt Disney World. 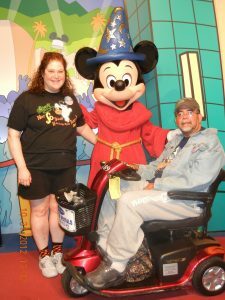 2012- A subtle but significant change: Ben stayed in the scooter when he met Mickey Mouse. You and your friends brought us a lot of joy at very trying times. You welcomed us into your kingdom and gave us fantastic memories. Since he has been gone, you have continued to entertain, console and inspire me. I have to admit that this very auspicious occasion has made me a little sad because my mom and Ben aren’t here to help me celebrate, but my memories of our times with you keep me smiling, even though there are also tears. 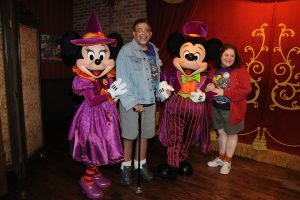 2011- Mickey’s Not So Scary Halloween Party. I held Ben on one arm and Minnie held him on the other! 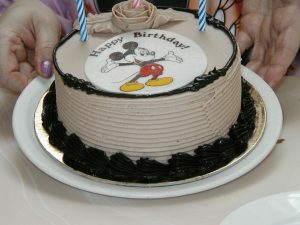 Happy Birthday, Mickey. May you always continue to be the spark of hope, inspiration and happiness for children of all ages. Today is Veteran’s Day, and yesterday was the 243rd birthday of the United States Marine Corps. 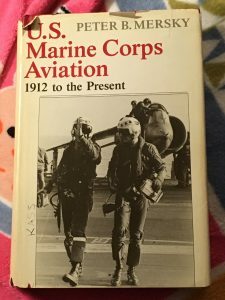 I’ve written about how the USMC was so important to my dad (click here for more). He was a patriot through and through. My dad was not a huge Disney fan, though he had a healthy respect for Mickey Mouse (he really had no choice in our house!) Truth be told, he and Walt Disney had something important in common: patriotism. My dad was in the USMC during the Korean War but he had a tremendous fascination with World War II, during which he was a child. He and I were so close and spent a lot of time together, but when he was ill, I cooked and ran errands for him every weekend, and Ben and I found lots of documentaries about WWII for him to watch that Daddy liked to watch with me. I still miss the days of going to bookstores and finding the new World War II titles, calling him and reading the jacket descriptions to see if they piqued his interest and buying the ones that intrigued him, despite his protests of his (not really) impending death and that he “won’t need them where I’m going.” Daddy and Ben actually enjoyed discussing the war when Ben was well and we visited him together. Sometimes, Ben would ask me a history question and we would call Daddy and get a very detailed history lesson by phone. My dad loved Ben knew all the important USMC and war event anniversary dates. Ben and Daddy bonded over their shared love of history, but they felt particularly close when they were both ill with terminal illnesses. The other thing they had in common was needing me as their caregiver. Ben and I found this book at a used/rare bookstore in Nyack, NY. Without even knowing that, the rabbi at the VA hospice told me that my dad treasured and was so proud of it, which touched my heart. 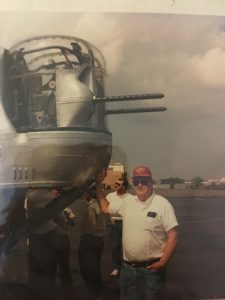 In his last years, my dad was concerned about the young men serving in the military. He took such interest in the guys in our neighborhood who were returning after various deployments and were struggling to adjust to civilian life. I met some of these young men when I visited my dad and was amazed at how well my dad knew their stories. He genuinely cared about these “kids,” as he called them. He felt they were the disenfranchised, abandoned by the government and that the general public did not relate to them. Daddy found reasons to tip the kids, give them things he knew they needed, and probably most importantly, listen to them. Ultimately, Daddy ended up at the VA hospital out in Northport, Long Island, in the palliative care/hospice unit. We were both grateful for the amazing care he received. It certainly is not the case at all VA Hospitals around the country. I was grateful to have had the experience of meeting many veterans in that palliative care unit, hearing their stories and feeling their dedication to this country. It fueled my own pride in this country and my devotion to the men and women who have fought and continue to fight to keep us safe. 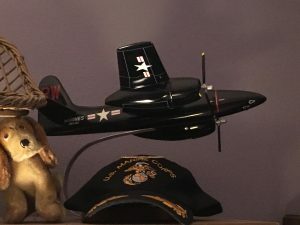 I proudly display his beloved model F7- the plane he flew and one of his USMC caps, and I keep his dress blues jacket safe and sound in my closet. Not many F7 planes were made during the Korean War- he studied aviation and this was the plane he trained on- so it was hard for my dad to find a model of it and this was treasured. 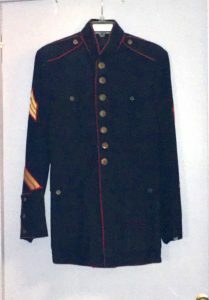 My dad’s dress blues jacket. I loved to try it on when I was young. He didn’t keep his cap, but this was dear to him and it carries loving memories for me. It pains me to think of how distraught my dad would be over what’s happening in the country now. Growing up, I dismissed his warnings that history was important because history repeats itself. I think about that so often now as I read the news. It scares me, and I fluctuate between wishing so much that I could talk to him about it and being relieved that he is not eating his heart out. Regardless of our individual opinions on America, today is a day to honor the veterans who have served this country. Their patriotism runs deep beyond politics that often puts their lives on the line. Daddy always wore a USMC cap and he loved when people thanked him for his service. When he saw other veterans with caps, he thanked them for their service. They would sometimes chat and reminisce. I think they liked to revisit the times when they felt strong and active. I once gave my dad a 2-disc DVD set called Walt Disney Treasures: On the Front Lines, which highlights Disney’s contribution to American military participation in World War II. My dad was amused by my ability to find this connection between my love for Disney and his love for WW2! In 2014, shortly after my dad passed away, Disney During World War II: How the Walt Disney Studio Contributed to Victory in the War, a fascinating coffee table book, was published. I bought the book because it reminded me of my dad and how much we embraced each other’s lives. John Baxter, the author, pointed out that during the war, Walt Disney’s studio primarily did military contract work- morale-boosting war dramas, troop entertainment and training films for the military and, unlike big companies like US Steel and the Ford Motor Company, Walt Disney insisted that the studio did not profit from this work. Walt Disney said, “Actually, if you could see close in my eyes, the American flag is waving in both of them and up my spine is growing this red, white and blue stripe.” I think my dad could relate to that comment. 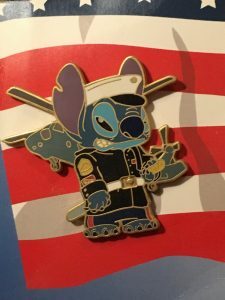 I had to have Stitch as a Marine! The USMC would never be the same! 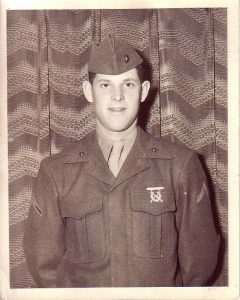 Today, and always, I honor my dad and all veterans on this day, with an extra special shout out to the USMC! Semper Fi! Thank you for your service! 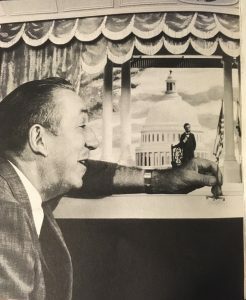 And, because he found his way to use his unique and brilliant talents to show his patriotism, thank you, Walt Disney! Daddy at Mitchel Field and the Cradle of Aviation Museum out on Long Island. He loved to go there. 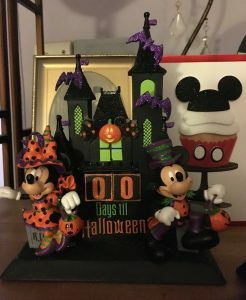 I dutifully counted down the days on my Halloween calendar figurine and here we are- today is Halloween. My fourth without Ben. Being home with bronchitis is adding to my melancholy. I did find comfort and joy in using that figurine. It made me smile to think about how Ben loved it and it felt good to honor that tradition. Stuck inside, I won’t see kids dressed up or give my students candy, though that will happen when I return. 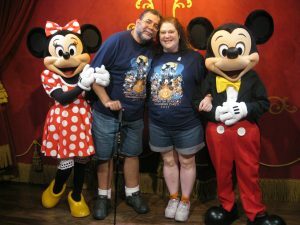 I will look at our photos and videos, listen to my Walt Disney World Halloween music, and reminisce about how much fun we had at Walt Disney World on Halloween. 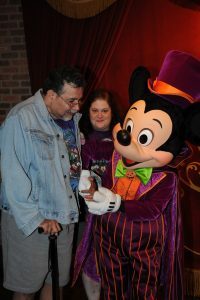 Halloween was truly magical there- after all, Ben proposed to me on Halloween at Walt Disney World. It was perfect! 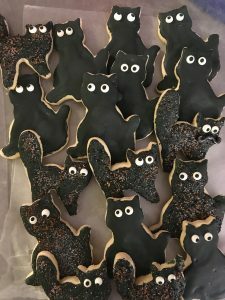 I did bake Halloween cookies and make Halloween cards with a photo of Disney. As I’ve said before, baking and decorating cookies is like my therapy. I am able to relax and get lost in the whimsy. 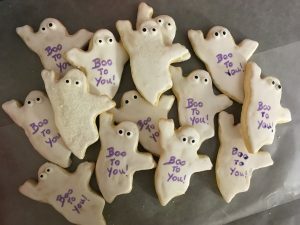 I tried hard to embrace my decorations (click here for that post), acknowledging that I was able to begin to embrace the Halloween spirit that, until this year, had left me along with Ben. Now, I’m more of a participant in the holiday, but I don’t feel the gleeful whimsy that I felt with him. 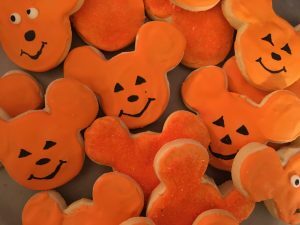 I look at footage from Walt Disney World’s Mickey’s Not So Scary Halloween Party and although part of me would love to experience it again, I wonder if I will ever again be able to attend that celebration. Without distractions at school, I’m surrounded by only memories, albeit good ones. 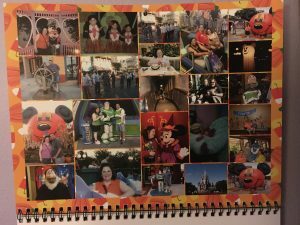 Every year, I’ve made a calendar that is a collage of favorite photos from Walt Disney World. It was a very positive process to make these calendars. I made them for Ben when he was here, too, since he loved to be surrounded by our photos. As you can see, October is filled with Halloween memories. I rejoice in them because Halloween is a treasured part of our relationship. At the same time, I grieve for Halloweens and other events, and even non-events, that we won’t have. And, over the past several months, I’ve struggled with anger that he was cheated out of so much life. The October collage on my calendar. Understandably, the most poignant memories were during our visits after Ben’s ALS diagnosis. I think about how Ben was embarrassed to meet Buzz Lightyear when he was in the scooter. Ben loved Buzz, but after ALS began to weaken him, he said he didn’t want to meet Buzz because Buzz was a strong super hero. I think he agreed to meet him more for me than for himself, though he thoroughly enjoyed watching Buzz interact with the kids on line and he had a child’s excitement. He was able to walk a bit with his cane at this point, and he wanted to stand with Buzz. We were never much for dressing up for the holiday, but Ben loved the Buzz shirt we found and I wore Minnie Halloween ears. Buzz made such a fuss over Ben’s shirt and he made Ben laugh, which made me so happy. Those are the important and beautiful memories. Ben truly did embrace life while facing death. Yes, some of that was denial, but much of it was inner strength and determination, and I believe it helped him to navigate life with ALS in a positive way. I’m still proudest of our summertime Halloween- our last but most magical visit to Walt Disney World. Here’s a link to that post. I hope that it offers some inspiration to anyone struggling. Ben did say that when the time came, he was going to be a grim grinning ghost at the Haunted Mansion. I hope he is and that he is having a ghostly good time. 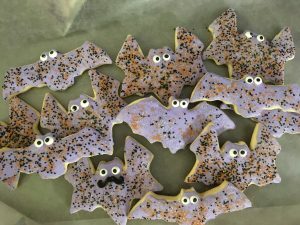 I wish everyone a Happy, Not So Scary, and Healthy Halloween! (I wrote this late last night) Today, October 27, is my birthday. My fourth birthday without Ben. I still seem to measure time that way. It’s still emotional to think of celebrating events without him. I can’t seem to feel happy. I want to indulge in that childish delight about a birthday, but I can’t shake the sadness. I always struggle on milestone events with not having Ben or my mom, dad and grandma- the people I was closest to- with me. Yet, it’s not just that, or guilt about continuing to navigate life when they aren’t here and conveying in any way that they are even a little bit forgotten. I don’t feel comfortable celebrating myself and, although I am so grateful for good friends and birthday wishes, I am much more comfortable celebrating other people. Maybe that says something about my self-esteem as much as it does about grief, which is definitely something I need to think about. I made plans with a good friend to go to the theater, which is always one of my favorite things to do, and I preferred to think about a show rather than my birthday. It was a nasty day with a nor’easter, which seemed fitting for my mood. We saw Oklahoma! At St. Anne’s Warehouse in Brooklyn, and although we were looking forward to exploring DUMBO, a neighborhood I had never visited, the storm limited our plan. I knew to expect that the show was a dark interpretation, which was sort of unusual for this musical, but also appropriate for my mood. Throughout the day, I got sweet texts and calls and posts on Facebook, which touched my heart. I really wanted to be happy, but trying to act happy actually made me sadder. Ironically, if it had not been my birthday, it would have been a perfectly great day. 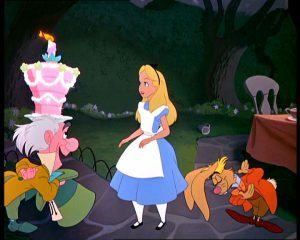 Maybe the March Hare was onto something when he talked about a very merry un-birthday. I find joy in so many things and from so many people. Those are my “un-birthday” gifts. I think about the wonderful birthdays I had with Ben. I loved that he always wanted me to feel special on my birthday, and he often planned little surprises for me. That was more about the romance than about the birthday. Now, I feel awkward making or being a part of the planning of my birthday plans. For so long, I defined myself by the way I cared for my dad and Ben. I planned surprises for Ben and took opportunities to celebrate him and us whenever I could find them. I need to learn to feel the confidence and comfort in taking care of and acknowledging myself. The time I asked Mickey how old I looked and he held his hand up and I asked if he thought I looked 5. He shook his head and held his hand up again and I asked if he meant 50. This went on for a while until he held up one finger at a time and I realized that he only had 4 fingers. He looked up at the ceiling and held his hand to his forehead and when I looked over at Ben, he and the PhotoPass photographer were laughing hysterically. Ben couldn’t believe that I didn’t know my Disney buddies had 4 fingers and he said the photographer was laughing so hard that she couldn’t take a picture. From that point on, Ben and I only “high four-ed” each other. The birthday holiday we took there when Ben proposed to me. The actual proposal was on Halloween because he knew I would love that. I did. Mickey congratulated us on our engagement! Birthday hugs from Pooh, Eeyore, Tigger and Piglet at the Crystal Palace, because I had to have birthday lunch with my friends from the 100 Acre Woods. I was as gleeful as a 5-year-old when the waiters sang “Happy Birthday” to me. Ben surprised me with a cake once and Pooh kissed my hand. I’ve kept all the confetti and the birthday cards. The little girl at the Akershus Restaurant whom I noticed was intently watching Ben and me as we struggled a bit to get him into a chair and then as I cut his food and helped him to eat. When she saw the waiter bring me a little cake with a candle and sing happy birthday to me, she came over and wished me a happy birthday and gave me a hug. Kids have such intuition, and her mom and I both had tears in our eyes. Dancing with Stitch and Goofy at the Halloween party while Ben sat in his scooter, laughed at me (with love) and videotaped it. As if anyone who knows me would be shocked!! Getting extra candy when we went trick-or-treating at Mickey’s Halloween Party because I announced that it was my birthday, probably more excitedly than most of the little kids. Between Ben in the electric wheelchair and my birthday, we did very well collecting candy! Having so much fun tasting the foods at the various pavilions during the Food & Wine Festival. Even though he needed help with food, and he couldn’t eat everything he wanted, Ben loved to be at Epcot and he didn’t let himself lament what he couldn’t do or eat. His attitude was incredible. 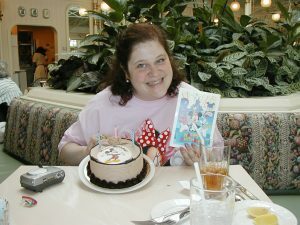 And then there were the magical birthday surprises that were not spent at Walt Disney World. There was a time that my birthday fell on parent teacher conference night. Ben and I had decided that we would celebrate over the weekend instead and it was no big deal. 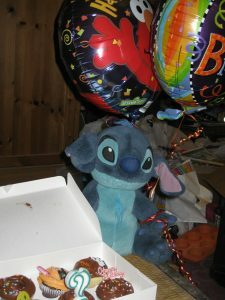 He picked me up at school, as he always did after evening events, and when we got to my apartment, I was delightfully surprised to see that he had decorated with balloons, flowers, a cake and some of my Disney toys all around the decorations. He had done all of this after work and before meeting me. That was Ben-always romantic. I am grateful to always have those very sweet memories, and so many more. I grieve for the birthdays I won’t have with Ben, and also for the birthdays he won’t have. But, I’ve often felt his presence and I know that he is with me, as are my mom, dad and grandma. People say that Ben would want me to be happy and to celebrate. I’m sure that’s true, but it still doesn’t feel quite right. Maybe it will feel better on a very merry un-birthday! At the Walt Disney World Wishing Well at Cinderella’s Castle- Making a wish! Disney’s Animal Kingdom- 2001. Ben was psyched to meet Baloo! Disney’s The Jungle Book celebrated the anniversary of its 1967 release just this past week on Thursday, October 18. Of course, I had to re-watch this classic tale of Mowgli, a man-cub who is raised in the jungle, nurtured by some animals and hated by Shere Khan, the tiger who hates man and is determined to kill Mowgli. It is also a sweet tale of Mowgli’s relationship with Bagheera, the wise panther who teaches and watches over him, and Baloo, the big goofy bear who is a great and caring friend. I always smile when I watch this film, because Ben loved Baloo and fancied himself a big,cuddly bear- a description with which I must agree! During my viewing this time, I thought about how much The Jungle Book has to say about a caregiving relationship and how Ben and I confronted ALS. Bagheera has all the qualities of a good caregiver: patience, the ability to listen and reason, understanding of Mowgli as a man-cub within the jungle environment, willingness to let Mowgli test himself, reliability, intelligence, common sense and loyalty. Who could ask for more in a caregiver? Baloo is a great buddy, and he and Mowgli have a deep friendship and love, but Baloo also needs the guidance of Bagheera. When Baloo resists the reality that Mowgli needs to return to the “man village” and be around people like himself, Bagheera needs to remind Baloo that although he loves his little buddy and thinks of him as a son, he has to see the big picture in caring for Mowgli and that he has to think about what was best for Mowgli and not just for himself. Those are tough choices and I remember them well. Caring for Ben meant never losing sight of what our priorities were. Like Baloo, there were many times when I felt Ben deserved to indulge in any of his whims because I did not know how long he would have that luxury. And, we knew that time was not on his side. 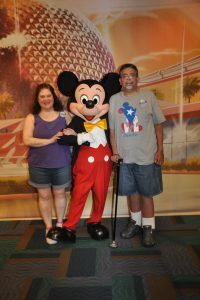 Taking him to Walt Disney World for one last visit was a very joyful indulgence. There were also the gut wrenching realities. I remember that after Ben repeatedly said that he wanted to go home from the hospital, I just wanted to honor his wishes and I asked his doctor if it would be possible to bring him home. His doctor, who proved to be my Bagheera, provided the wisdom and the reasoning, and then I had to have those heartbreaking conversations with Ben. There were stressful times when, just like Baloo and Mowgli, we argued and sulked. But, the caring in caregiving never went away and neither did the love. I suppose that ALS was our Shere Khan. The wolves who raised Mowgli from the time Bagheera found him knew that they could not stand up to Shere Khan. They did not stop loving Mowgli, but they knew that he could not continue to live with them or Shere Khan likely would have killed all of them. Caregiving also comes with these difficult decisions. Sometimes it’s a matter of caregiving becoming so difficult that it poses physical and emotional risks to a caregiver. In Ben’s case, had he not chosen to go to hospice and separate from the vent, he would have had to go to a facility because he could not have lived in our apartment with a tracheostomy, needing 24/7 nursing care. This was not an option we liked but it was one we had to accept. I could relate to the battle in which Shere Khan seriously wounds Baloo- the fight to protect and care for Ben did take a toll on me in many ways, but love and devotion kept me at his side. Just like Shere Khan, ALS was a deadly force, but, unfortunately, in our true story, it was one that we could not outwit or defeat. I don’t know that I would run to Baloo for help in a crisis, though he might be great comic relief! But, Baloo was protective of Mowgli and he has a good message. As caregivers, we don’t often get to “forget about your worries and your strife” and life seems much more complicated than “the bare necessities.” And yet, it is so important to take the time to cherish and remember the simple and wonderful aspects of our relationships and life prior to caregiving. Try to focus on those things when the stress becomes severe and you start to forget who you were before you were in a caregiving relationship. 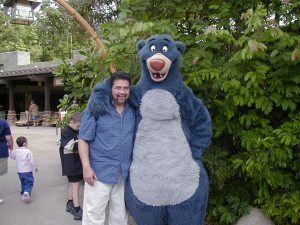 As for me, I think I was a combination of Bagheera and Baloo- a dedicated, thoughtful caregiver, acquiring skills and perspective during on the job training, with a sense of humor and incredible klutziness. Importantly, Ben always felt safe and secure with me. How about you? What do you consider the important skills of caregiving? Are you more Bagheera or Baloo?